Despite its hardy exterior, corn is quite prone to deterioration. If handled improperly, even the sweetest kernels can lose their succulence in just two days. Fresh is most certainly the best! Here are some things to keep in mind when stalking perfect corn. Keep it cool: heat and dehydration make sugar turn to starch. Look for ears that are cool to the touch, and store them in the fridge. Green is good; tender, slightly damp green husks are nature’s moisture seal. Avoid ears of corn with yellow exteriors that look dried out. Pleasantly plump: Full, firm kernels are signs of freshness. Simply squeeze an ear through its protective husk rather than tearing the layer off and exposing the kernels to the air. If the only corn available has already been husked, avoid kernels that are hard or dimpled. Fringe benefits; Tassels should be golden brown and slightly sticky. Pale tassels indicate that the corn was picked too early. Black tassels mean it’s old. What about husking that fresh corn? Do there seem to be hundreds of corn silks to get rid of? 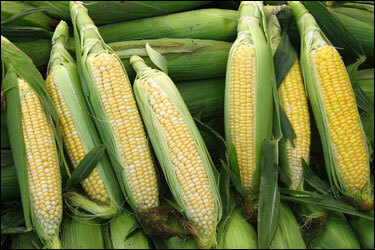 There are, in fact, as many corn silk as kernels of corn on the cob. But the fresher the corn, the easier it is to husk it. The sticky silk is only troublesome on corn that’s a couple days or more old.